John Updike is one of the most prolific and important American authors of the contemporary period, with an acclaimed body of work that spans half a century and a source of inspiration that ranges from American exceptionalism to American popular culture. 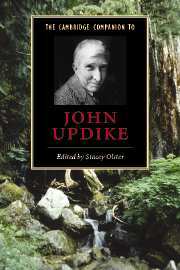 This Companion's distinguished international team of contributors addresses the major themes in Updike's writing as well as the sources of controversy that it has often provoked. They trace the ways in which historical and cultural changes in the second half of the twentieth century have shaped not only Updike's reassessment of America's heritage, but his reassessment of the literary devices by which that legacy is best portrayed. Includes a chronology and bibliography of Updike's published writings. Introduction: 'A sort of helplessly 50's guy' Stacey Olster; Part I. Early Influences and Recurrent Concerns: 1. Updike, middles, and the spell of 'subjective geography' D. Quentin Miller; 2. 'Nakedness' or realism in Updike's early short stories Kristiaan Versluys; 3. Updike, religion, and the novel of moral debate Marshall Boswell; Part II. Controversy and Difference: 4. Updike, women, and mythologized sexuality Kathleen Verduin; 5. Updike, race, and the postcolonial project Jay Prosser; 6. Updike, ethnicity, and Jewish-American drag Sanford Pinsker; Part III. American Chronicles: 7. Updike, American history, and historical methodology Edward Vargo; 8. Updike, Hawthorne, and American literary history James Plath; 9. Updike, film, and American popular culture James A. Schiff; 10. John Updike, Rabbit Angstrom, and the myth of American exceptionalism Donald J. Greiner; Conclusion: U(pdike) & P(ostmodernism) John N. Duvall; Select bibliography.